Minorities are a paradoxical thing. Even though they are composed of a small amount of people, they can have incredible influence. Many major advancements and legal movements have been spear-headed by minorities, ranging from the followers of Copernicus spreading the word of heliocentrism, to teetotalers advocating for alcohol prohibition, and ultimately amending the constitution, in the U.S.. Few great achievements come without challenge, and equal treatment for black citizens under the law appears to be one of those things. 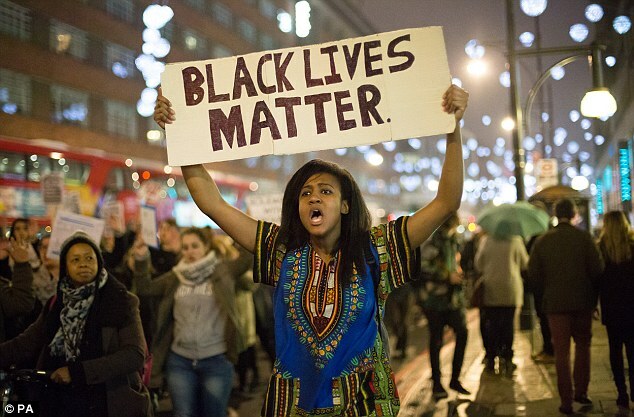 We know from history that small groups of people can accomplish big things, which is why it’s important to keep the Black Lives Matter movement alive for change to occur in penal and legal overreach. For decades, social psychologists have studied minority influence, which, as you may have guessed, is the capacity for a small group of people with an unpopular opinion to change beliefs.1,2 In any given social issue, the dominant group, or those in power, have the most social influence over the target population, the people the group is hoping to influence. But minority groups gain traction by challenging the dominant group, presenting themselves as innovative alternatives to the status quo.3 Research has largely found that opinion change caused by the majority is often temporary and public, whereas opinion changes caused by the minority are indirect and persistent.4,5,6 Majorities inspire public conformity, but minorities foster true attitude change. Unfortunately, privately held opinions don’t help to propel minority movements, but they may be a better reflection of where someone will allocate his or her voting power, alone in a cubicle in an elementary school gym. In addition to being influential, people who are in minority groups are liked by others. One study planted minority influencers in teams over the course of a 10 week study, and found that teams with members that advocated for the minority position improved their divergent thinking and came up with more original products than control groups without a minority influencer.7 Minority influencers were also given higher ratings by peers, indicating that group members valued the minority contributions.7 Since we know that groupthink can lead to terrible decision-making, it is not that surprising that team members would value teammates who help to point out potential pitfalls. However, it is surprising that those minority members were better liked than people who shared the majority opinion, giving us hope that social change doesn’t have to equal social conflict. Individually, we can all do our part to open our minds and hearts to the message of minority movements, and allow ourselves to be guided by the evidence at hand over political dogma. The Black Lives Matter movement has already had an incredible influence on the political climate of the 2016 election. As long as they continue to challenge the status quo with consistency and credibility, attitude change is all but inevitable. Maass, A., & Clark, R. D. (1984). Hidden impact of minorities: Fifteen years of minority influence research. Psychological Bulletin, 95(3), 428. Moscovici, S., & Lage, E. (1976). Studies in social influence III: Majority versus minority influence in a group. European Journal of Social Psychology, 6(2), 149-174. Mugny, G., & Pérez, J. A. (1991). The social psychology of minority influence. Cambridge University Press. Maass, A., & Clark, R. D. (1983). Internalization versus compliance: Differential processes underlying minority influence and conformity. European Journal of Social Psychology, 13(3), 197-215. Nemeth, C. J. (1986). Differential contributions of majority and minority influence. Psychological review, 93(1), 23. Moscovici, S., & Personnaz, B. (1980). Studies in social influence: V. Minority influence and conversion behavior in a perceptual task. Journal of Experimental Social Psychology, 16(3), 270-282. Dyne, L., & Saavedra, R. (1996). A naturalistic minority influence experiment: Effects on divergent thinking, conflict and originality in work‐groups. British Journal of Social Psychology, 35(1), 151-167. Nemeth, C., & Wachtler, J. (1974). Creating the perceptions of consistency and confidence: A necessary condition for minority influence. Sociometry, 529-540. In honor of Halloween and all things occult, I wanted to explore a historical event I was morbidly fascinated with as a child: the Salem Witch Trials. When I was younger, I couldn’t get my hands on enough novels and non-fiction books on the subject. I read The Crucible and watched the movie, and I was also fortunate enough to have relatives who lived in Salem, MA, so I got to visit most years around Halloween. While in Salem, I would walk through the cemeteries where the alleged witches had been laid to rest and read their tombstones. These ancient tombstones actually listed the method used to kill the accused. I remember being completely engrossed in the event the more I learned about it—I couldn’t get past the swiftness of the accusations, the unfairness of the trials, the conformity, and the upturned power hierarchy of the Salem community. I didn’t necessarily think of it in those specific terms at the time, but in retrospect, my nascent social psychological wheels were turning. What exactly happened during the Salem Witch Trials? What perpetuated the mass hysteria? Why did it take so long to stop? Actually, research on groupthink suggests that what happened in Salem Village* wasn’t all that unusual; terrible, yes, but surprising? Perhaps not. A few factors combined to allow for the perfect storm of the Salem Trials. Groupthink1 is a way of thinking characterized by an excessive emphasis on group cohesion and solidarity. Often, group harmony is prioritized over making an accurate judgment, allowing for important information to be ignored. Groupthink is most likely to occur when the group is highly cohesive, isolated, stressed, has poor decision-making procedures, and a forceful leader. Nearly all of these factors existed in Salem Village during the winter of 1692, the time leading up to and including the witch trials. Highly cohesive group and group isolation. The Salem villagers were Puritans, tightly knit together by their religious beliefs, including fear of the Devil’s work. Because of their religious convictions, recent attacks by Native Americans, and tension with the wealthier Salem Town, the Salem villagers were distrustful of outsiders, leaving them to rely primarily on each other for support. Forceful leader. Reverend Samuel Parris, the first ordained minister of Salem Village, ruled strictly and was known for his greedy nature. Editorial note: he doesn’t seem like the type of person who would allow people to speak their mind. High stress. The 1692 winter was a particularly harsh one, which strained Salem Village’s resources and increased their reliance on Salem Town. Adding to the strain was a number of displaced people from King William’s War, who landed in Salem Village, and a smallpox epidemic. Poor decision-making. 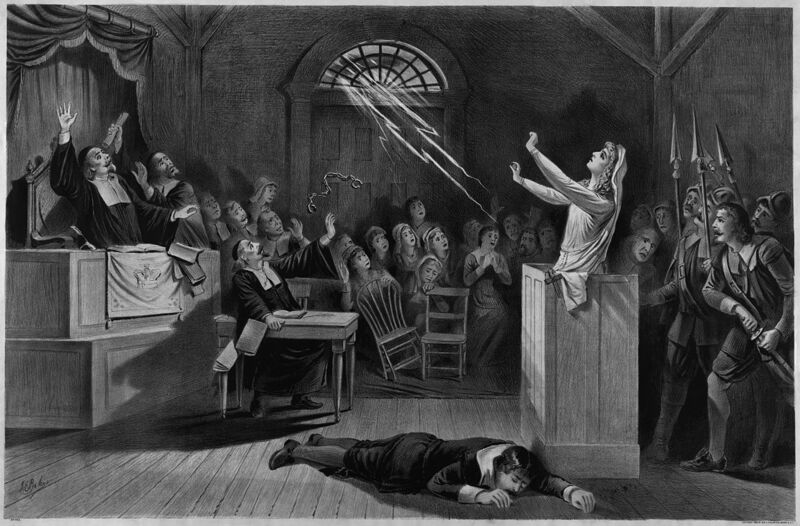 The trial process, a term I use loosely, allowed testimony about dreams and visions to be included, despite opposition from the respected minister Cotton Mather; likely, his voice just wasn’t loud enough to stop the momentum yet. Female children as young as four years old who were connected to accused older women, like Dorothy Good, daughter of Sarah Good, were questioned and thought to have confessed. These are just a few of the ways in which poor decision-making was employed. Belief in the moral correctness of the group. Need I remind you that these were deeply religious people? They prayed every day and considered themselves to be the elect. In other words, they believed they had been predestined for heaven, chosen uniquely by the God they believed in. As K. David Goss put it in Daily Life during the Salem Witch Trials, their Puritan faith was all-encompassing. These religious beliefs contributed to a lot of self-censorship and the pressure to conform, particularly among women, who were expected to aspire to the ideal virtuous woman as described in the bible (see Goss’s book for more). This pressure to conform and to limit personal beliefs likely increased significantly once accusations were being made, lest someone turn an accusation on someone who dared to speak her mind. Considering the ripening groupthink conditions of the stressed and isolated place of Salem Village, the mass hysteria and frenzy of the Salem Witch Trials wasn’t completely unexpected, at least in hindsight. That it can be explained doesn’t detract from the horror, death, and upheaval that occurred. And community members of Salem did eventually put a stop to the madness, perhaps because the stress was unsustainable and damaged the group cohesiveness. The diminished cohesiveness may have allowed an opening for some powerful community members to feel comfortable enough to speak up. A public apology was eventually made in 1697 by Judge Sewall, who had overseen many of the trials, but it was too little, too late. Groupthink had left a permanent mark. *The place where the witch trials occurred was actually Salem Village, present-day Danvers, and was established several miles from Salem Town, now present-day Salem. See http://salem.lib.virginia.edu/Witch.html for more information. 1,2 Janis, I.L. (1972). Victims of groupthink: A psychological study of foreign policy decisions and fiascoes. Boston, MA: Houghton Mifflin.